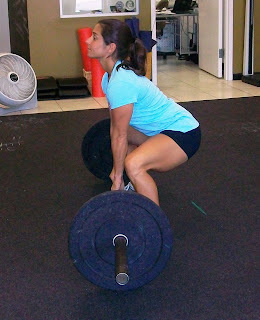 The Sumo Deadlift High Pull builds on the Basic Deadlift post from last week. Additions include a widening of the stance, bringing the grip inside the knees, adding a shrug, an upward pull with the arms, and most importantly, additional velocity. The move requires an aggressive extension of the hips and legs before the arms pull. Once you get in the “set up” position I again recommend holding for a few seconds to feel where your body is and review the above points. A common fault is allowing the knees to roll in. If that happens, check your stance to make sure it is not too wide and consciously pull your knees apart. -return the bar down fluidly in the reverse sequence: arms, then traps, then hips, then knees, back to the set up position. The most common fault with this exercise is pulling too soon with the arms, the hip not completely open before the shrug or arm pull. A quick and easy fix is to learn the exercise in steps. Emphasize that the hip needs to fire first, before the arms. Try 2 sumo deadlift shrugs for every full sdhp; do as many times as needed to get it right. Beginners: stay with very little to no weight initially (using your pvc, wooden dowel or broomstick), use as a warm up of about 10 to 15 reps. Work them into your bodyweight exercises as a pulling movement. Intermediate: increase the weight gradually and keep the reps in the 8 to 12 range never compromising form for weight. Include them in your routine as an exercise for hips and back rounding out the workout with push, single leg strength and core work. Advanced: incorporate into your regular routine with a variety of both light and heavy loads using rep ranges of 10-20 and 5 to 8. One of my favorites is to perform circuit style; for example, 10 bench presses, 10 sdhp, 100 m sprint, 60 — 90 s rest, 5 to 7 rounds. This movement is excellent for core development, functionality, increased power output and improved coordination. What are you waiting for? Take your workouts, sport performance and activities of daily living to the next level by incorporating today. If all else fails you can at least deadlift the milk crates to the counter tops!